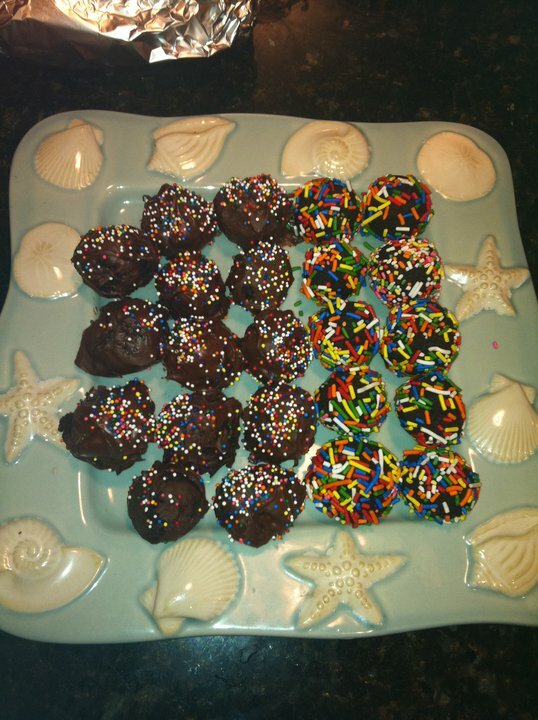 Cake Balls Made Simple — Twila & Co.
One of my good friends asked me for my recipe on how to make cake balls today and after putting it together, I thought it might be something fun to share. Making them is simple and everyone loves them! This recipe makes it easy for you to change and manipulate to make any type of cake ball you could imagine! Make your cake! Whether it's from a box or from scratch, make the cake like you would normally. Bake it and let it cool. Tip: I know sometimes with some baked goods we like things to be gooey and a little soft. For cake balls, you want to make sure it is cooked through THOROUGHLY. No gooey-ness! Once your cake is COMPLETELY cooled, grab your food processor and get to work. Make that cake into crumbs. All that hard work mixing that box just to make it into crumbs? Don't worry, it's totally worth it. Dump all the crumbs into a big bowl. Add in whatever icing you'd like (icing should be at room temperature for easier mixing). FREEZE! Put your icing and cake mixture in the freezer until firm. It might take an hour or two. Once frozen, put out some wax paper and start rolling. Get some pans out to put all the little cake balls on. Dip in melted chocolate...and sprinkles...and anything else! This is only a small sample of how many the recipe made. I had a TON. If you want a funfetti cake look, DO NOT add the sprinkles when you bake the bake. Add them in step 3 with the frosting. You can dip the cake balls in any color chocolate. Find your local baking store or Michael's for colored chips. Try out different sprinkles or themes. White/Yellow Cake with Vanilla Frosting and sprinkles, dipped in a fun color of chocolate. Red Velvet Cake with Red Velvet or Chocolate Frosting, dipped in chocolate. Peanut Butter cookie/cake with Chocolate Frosting, dipped in chocolate. Strawberry Cake with Strawberry or Vanilla Frosting, dipped in chocolate.